It is summer time and as such, it’s about time that I do some reading. I nipped to a local charity shop today and saw that they had a little pile of plays, and so because I don’t have a thousand books waiting to be read at home *cough cough* I grabbed them and just picked the first off of the pile to read today. 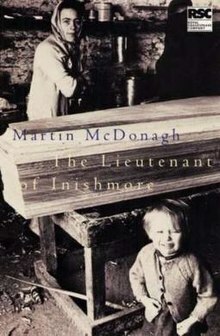 The Lieutenant of Inishmore is seventeen years old now. Or to go by date written, twenty-four. Each of those different times is very relevant as it is focused on the troubles in Ireland and on a young man, Padraic, who “the IRA wouldn’t let in because he is too mad”. The first time we see this character he is pulling the toenails off of a drug dealer, but stops midway through when he hears his cat is unwell, and immediately returns home. Alas, his cat is not unwell, but in fact dead – something that fills his father with dread at the reaction he will give. Make no mistake, Padraic is absolutely crazy, yet the idea of presenting an INLA member like that on stage in 1994 sounds equally as crazy. From what I have now read, producing the play in 2001 (pre-9/11 when the IRA were still largely present in the UK) was also controversial. The revival taking place at the moment puts it into a different context, but seeing into the personal life of a terrorist is a an unusual situation to be in, and I can see its current day relevancy. Is it any good though? Well, as is often the case when reading a play instead of watching it be performed, it is very difficult to say. However, rarely have I read a play with my jaw so firmly dropped. It is mental. I have no idea how you would present some of it on stage (exploding cat anyone?) and I found on paper at least, some of the characters to wildly wobble – Davey for instance several times literally has a gun pointed at his head and is about to die and yet can’t help himself making snide comments, despite being portrayed as an effective coward. These are not really issues that I don’t think could be dealt with by a skilled director, but reading them was not the best way to understand these characters, and unfortunately somewhat puts me off seeing the play. So with time stretching ahead, I think a few more plays should be in the offing – there’s a new one on the GCSE specification, so I need to do that at the very least – which tend to be shorter, so hopefully a few more updates to come.